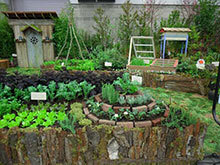 Abundant Nature was our installation garden at the 2014 Yard, Garden and Patio Show. Abundant Nature provides food and forage for humans and wildlife in a natural system that is easy care and self-supporting. It reflects the canopy layers found in the forest, and weaves urban objects into a magical setting. The garden , a collaboration between the Garden Design Studio and two additional local designers, weaves together play spaces, native and edible plants, as well as welcome areas for fairies and nature spirits that celebrate their partnership with people sharing mutual respect. The impermanence of our activities results in an imperfect beauty. That is nature! Please go to take a look at more information about Abundant Nature: An Enchanted Food Forest, as well as a gallery featuring a slideshow and videos at the Abundant Nature website.